It's Wednesday, which means it's time for our weekly installment of new arrivals. For today's roundup, we've searched high and low to find the best in designer and fast-fashion pieces—all of which just hit stores—so that you can be the first of your friends to wear them. From the party tops we love at every budget to the cozy jackets that have us excited for winter, we have something for every style type and price point. Now your only problem will be narrowing down your favorites and making room in your closet. No words for this Gucci top of our dreams. Available in sizes 40 IT to 46 IT. Upgrade your fringe-hem jeans for a feather version. 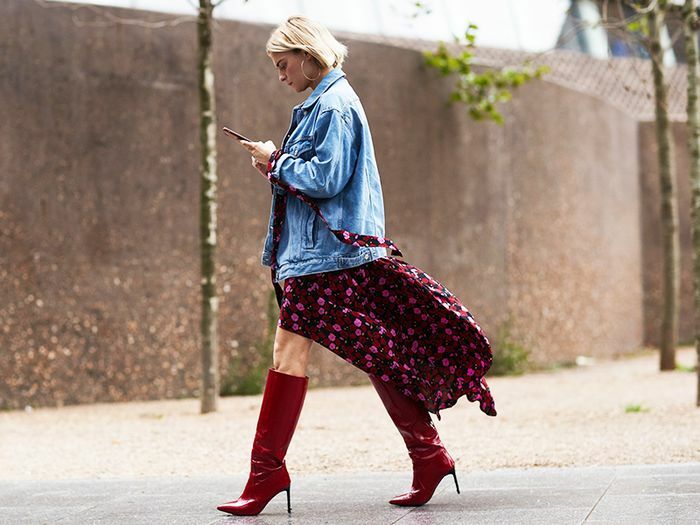 These statement boots feel surprisingly versatile. This will make any outfit instantly cool. The Attico girls can do no wrong. We'd buy this just because of the name. This ultra-soft top will make your winter layering so much easier. The combination of this color with the ribbed material is everything. Bra and leggings available in sizes XS/S to M/L. Who else is obsessed with catchalls? Make this your next party look. We're loving these atypical shades. Not your average cropped sweater. Puff sleeves and embroidery make for a perfect combo. We love the button detail on this. Everyone's favorite sneakers just got a luxe update. Last but not least, statement heels you can wear literally anywhere.